outside-the-classroom educational and mentoring program. 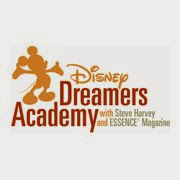 The 2014 Disney Dreamers Academy, now in its seventh year, will take place March 6 th – 9 th, at Walt Disney World Resort in Florida. Disney Dreamers Academy continues to hold true to its mission to inspire and fuel the dreams of teens, help them discover a world of possibilities and help them prepare for the future. Annually, 100 U.S. high school students, selected from thousands of applications, embark on an all-expense-paid trip to Walt Disney World Resort in Florida for an immersive four-day program that inspires and fuels their dreams. Both onstage and behind the scenes, the Disney theme parks become vibrant ‘classrooms,’ leading to career discoveries, the pursuit of dreams and fun memories to cherish for a lifetime. Motivational speakers and celebrities share their stories and provide insight on how to achieve success and DREAM BIG. Dreamers have the opportunity to cultivate relationships with other students from across the nation while they gain firsthand knowledge from Disney experts and world-renowned entrepreneurs and executives. This is awesome. A wonderful Program! I think this is a wonderful program. Everyone needs to have their freams supported! This looks like such an amazing program!! I heard about this before and its a really great program! What a great opportunity for these kids. I hope they do get to fulfill some of their dreams. really really love this program. disney does so much for our youth and i applaud that! Sounds like a wonderful program. Glad to hear about more of these types of programs to give our youth goals to shoot for! This sounds like an inspiring program for young people. I have heard many wonderful things about this program. It seems like something that will benefit the children now and for years to come. This really sounds wonderful for kids to help them move closer to their dreams! What an amazing program-- thanks for sharing! I bet a lot of people are really looking forward to this! Sounds like fun!